After being delayed for two hours the previous day coupled with a truly indescribable traffic jam, our group was disappointed when we finally arrived at Agra on March 3rd at 6:15 pm. The gates to the Taj Mahal closed at 6! We resolved to wake up the next morning, (for the second day in a row), at 5 am. We were determined to be part of the first cohort of tourists to view the Taj that day. Our exhaustion and frustration was allayed within one look at the Taj Mahal. Its beauty and splendor is truly staggering.For a typically talkative bunch, we fell silent and listened as our tour guide relayed the story of Emperor Shah Jahan and Mumtaz Mahal. The white marble mausoleum is essentially a large tomb that Shan Jahan build to commemorate the life of his favorite wife Mumtaz Mahal. Arguably, the most beautiful structure in the world, words simply cannot do justice to the Taj Mahal.Therefore, when trip participants think back to their trip to India, the image is indelibly sketched into our memories. On March 3, 2010, we went to the Taj Mahal. It was truly truly amazing. 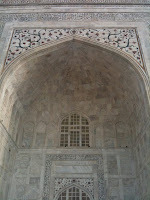 It is located in Agra and built in the 1600s by Mughal Emperor Shah Jahan in memory of his favorite wife, Mumtaz Mahal. She was his 3rd wife and bore him 14 kids. She became ill after the birth of her last child and died. She requested that he build a memorial for her and thus became the Taj Mahal. It took 22 years to build and thousands of craftsmen worked on the Taj. The emperor's wife is buried in its direct center. The emperor wanted to build a black Taj Mahal for himself but this didn't happen. Instead, he was imprisoned by his son who became the next emperor and who killed two of his own brothers in order to do so. When the emperor died, he was buried next to his wife in the Taj. His tomb is the only thing in the Taj Mahal that is not symmetrical. It was a truly magnificent structure, the work intricate, the precision in the details and the enormity of it all were really breath taking. I felt so small standing next to it. It was quite a contrast to the slums that we had just visited where people were living in poverty on the streets, in store fronts and in makeshift structures. Then here we come to the Taj Mahal which represented such wealth, fame and power. It was really incredible. A true wonder!